Named after Sir Edwin Lutyens, The Ned is the flagship 5-star hotel from the Soho House group. The hotel houses nine restaurants including Soho House favourite Cecconi's. 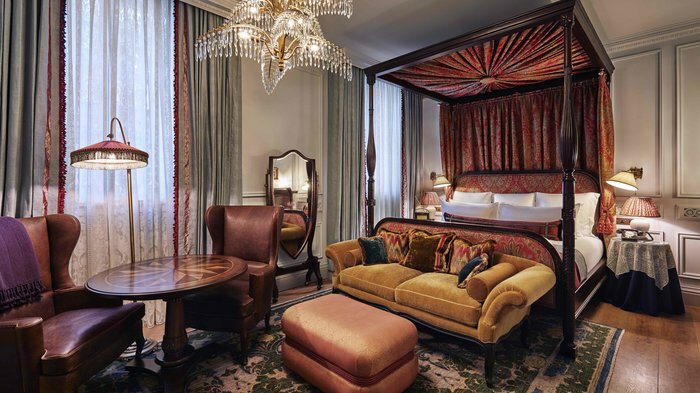 5-star hotel from Soho House group with nine restaurants and a private members club in the City of London. The Grade I listed former Midland Bank headquarters in the City of London, originally designed by Sir Edwin Lutyens, has become The Ned, a flagship 5-star hotel from the Soho House group. Former directors' and managers' offices on the upper floors are now 252 suites and the banking hall houses seven of the nine (NINE!) bars and restaurants. A rooftop bar with landscaped terraces, swimming pool, health spa and gym complete the luxury offering and the vast Ned hotel also includes event spaces and a private members club. From cheap budget hotels to luxury 5 star suites see our special offers for hotels, including Holiday Inn Oxford Circus from 60% off.